'Shrooms – just a cute way of saying mushrooms! Go easy with the chilli flakes (read below!). 1 Crank the oven on to 220°C (425°F), and line a shallow baking tray with baking paper (jellyroll pan type of thing and parchment paper if you’re in the US). Not only can you serve them ‘rustically’ in the baking tray itself, it also, and most importantly, makes the clean-up quicker! 2 Wipe the outer skin of the mushroom caps (the ‘shrooms!) with damp paper towels to get off any little spooky bits of dust or whatever, and then brush with some of the oil (there will be some oil left for drizzling over the mushrooms before they go into the oven so they don’t dry out). 3 Transfer the ‘shrooms cap-side down to the baking tray and season with salt and freshly ground black pepper. Mop the feta with paper towels to get rid of the excess liquid that floats around. 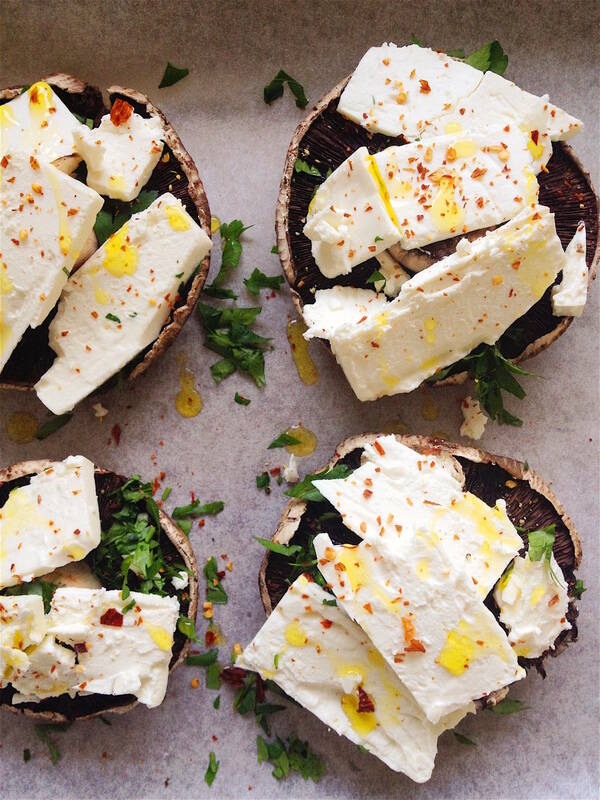 Sprinkle parsley over mushrooms, top with feta and a sprinkle of chilli flakes. 4 Drizzle with the remaining oil and pop the baking tray in the oven for 15 minutes. Once they smell good and the cheese browns a little they’re good to go! When I was testing these I also photographed them and thought the red chilli flakes would look nice in the photograph so I was rather generous with the chilli. Without thinking, I stuffed one in my mouth straight from the oven and I seriously nearly died!!! There was so much chilli on them and they were piping hot and the excessive steam just made the chilli burn worse haha. I couldn’t taste anything for the rest of the night! My lips burnt for so long and I had to take some time out, lie down on the couch and pat the kittykats (vigorously, to distract me). So don’t do that, be moderate, and wait till they are at a digestible temperature before tucking in. Thank you Maree. We try to have a bit of fun to lighten tough times, and we seriously want to keep people cooking from scratch. Glad you ‘get’ us. Ilaria seems happy stirring. What's she up to?